The OP lists several reserach sources which people can follow up. One of these is an NHS link. Drug companies have placed people in the position of needing to taper while providing extremely little information on how to safely do so. For this reason people have had to learn how and where they can, sharing and creating knowledge bases. Those who have done this work are now quite relieved to have science begin to realise there is a crisis, and start to conduct appropriate research. That the two groups are starting to work together is also quite telling. There was recently an overwhelming response to a large research survey. This grass-roots quality is also what allows SurvivingAntidepressants to use folk-references and word-pictures to illustrate processes alongside the usual thorough explanations. Whatever we can do to help people understand the rationale, we will do. The fate of Humpty Dumpty is a great picture, as is Rhi's metaphor of a trellis and garden. What we provide is not strictly Lancet; it is more than that. People do not need a medical degree when they arrive here desparate for information. Recently I took Alto's work (and in particular this thread's OP) to my local doctor. It was well-received, and I am now working with the doctors to implement suitable changes in the clinic, and also in other clinics in our region. Doctors who are less biased and less afraid are able to see that there is a crisis, and they tend to be pleased with the harm-reduction approach. Members are welcome to be skeptical, however we do not wish to repeatedly explain things we have already provided sources for, and which we have seen in action thousands of times. People are welcome to wait for science to offer irrefutable evidence if they prefer; in the mean time we'll get on with helping people as best we can. Also we are all volunteers here badly struggling with withdrawal and consequences of it and doing our best to support others in similar situation. So we don't have time nor energy to persuade anyone of anything. We are not in the business of proving any points or convincing anyone. Our suffering is very real and we don't need any proof of it. Problems you are talking about with your wife are different. She suffers with severe health anxiety so attacking us with your 'healthy scepticism' is a very misplaced attempt to solve your problem. She needs some good talk therapy to address the root cause of her issues. As you wrote yourself she has a tendency to worry about health irrespective of whether she reads something or not. There is no point in logically arguing with her and proving with any amount of evidence that her anxiety is unfounded. It's not a matter of reason but some deeply seated fear and insecurity which has to be unpacked and dealt with. All you need is a good therapist to work with her. Tapering is not her main problem. This was an excellent reply to someone who i felt had just walked into a war zone and wanted to start an argument and/or demanded proof about why we have to keep our heads down and take cover. I just looked at the tapering recommendation by Dr. Breggin. He advocates 10% reductions based on the initial dose rather than on the last dose. This would make the tapering time significantly less. Your thoughts? The 10% every 4 weeks of previous dose ends up being a similar curve to the dose occupancy curves. You will have to ask Dr. Breggin why his taper is calculated on the original dose. It may be he didn't consider the implications of this: he never helped many people taper. If you do it this way, your decreases become an ever-large proportion of your current dose. If you start at 20mg, at 4mg, a 2mg (10% of 20mg) reduction is 50% of the dosage to which your nervous system has (hopefully) adapted. You might start out slow, but you speed up as you go along. We have many people here who have tried this and developed withdrawal symptoms. 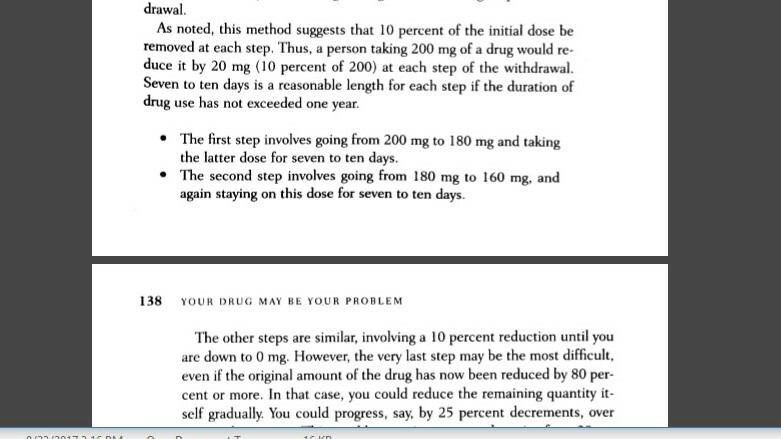 Periodic dosage reduction of 10% calculated on the current dose is a much gentler reduction curve than the method Dr. Breggin described above. Read Why taper by 10% of my dosage? Thank you ChessieCat! Guess I'm too eager to taper, but need to be reminded to slow down. For the 10% taper per month, is it ok to go down 2.5% each week as opposed to one drop of 10% all together? Yes, that is fine. This is known as the Brassmonkey Slide Taper, originated by one of our moderators, Brassmonkey. I am using this method myself on my taper of Lexapro and have found it works for me. As the link explains, you taper by four equal 2 1/2% cuts every four weeks followed by a 2-week hold. where his method is described as tapering by 10% of the original dose. Oh, sorry if this sounded brusque or like a criticism. I only wanted to point out that in that description it sounds like Breggin's method is 10% of the current dose too, which is not the case.